"Only a lion-hearted man can take this decision. He is a great player and he has taken it with great pride. For me, it was emotional, but he was firm. When I asked him if there is any pressure on him or any compulsion, he denied that saying he wants to concentrate in a different format," said BCCI secretary Sanjay Patel inVadodara. Meanwhile, former Indian cricketer Kirti Azad said he was disappointed with Dhoni's decision to retire, terming it unfair. "Dhoni's contribution is immense for Indian cricket. But a captain who helped win three World Cups, suddenly gives up, is just not fair. He should have announced it before the Test series that he is retiring and giving up captaincy, or he could have also done that after the series," he said. 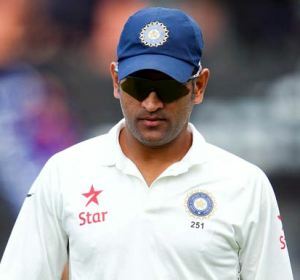 On Tuesday, Indian skipper Dhoni announced his retirement from Test cricket in order to concentrate on the one day international (ODI) and T20 formats.